In a small saucepan, combine the butter and 1 cup water and bring to a boil. Add to the flour mixture and, using an electric mixer, mix until combined. Beat in the eggs, one at a time, then the sour cream and vanilla. Divide the batter evenly between the prepared pans. Bake until a toothpick inserted in the center of each cake comes out clean, 35 to 45 minutes. Cool in the pans for 20 minutes, then turn out onto a rack to cool completely. Transfer one of the cakes to a platter and spread with ¾ cup icing. 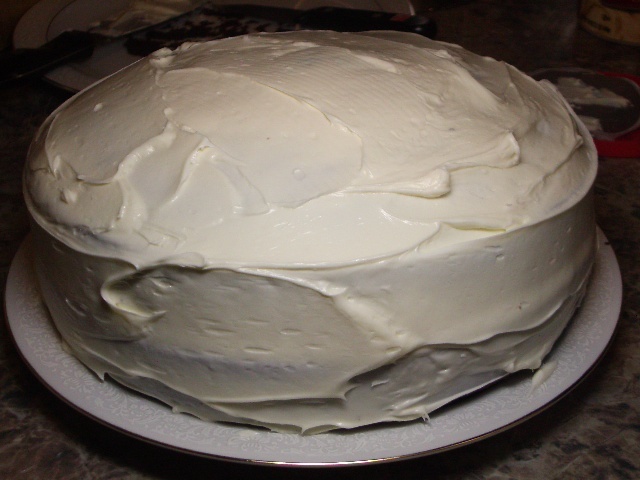 Top with the remaining cake and spread with the remaining icing. Put candles in the cake. Light them. Sing the Happy Birthday song. Cut into neat pieces. 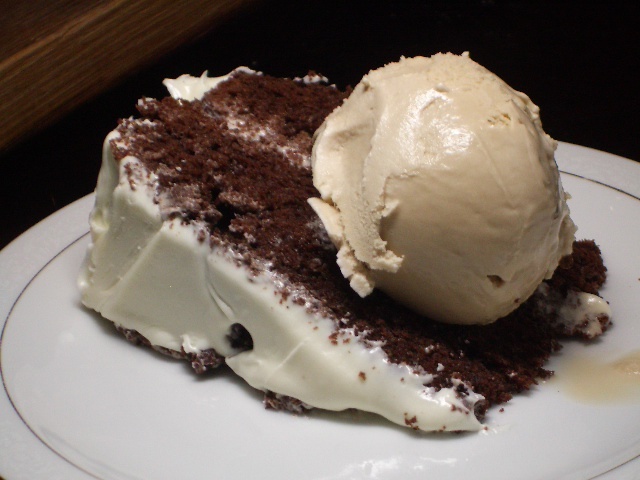 Top with coffee ice cream. Eat. Enjoy. Laugh. Have a second helping, you deserve it. Hey Reba! We actually used store-bought icing on the cake in the pictures..but that’s because we were short on time. My mom’s homemade icing is soooo much better – and easy! Try it – https://2frugalfoodies.com/general-tips/moms-homemade-icing/. I am always looking for an easy birthday cake recipe – homemade ones are so much better than store bought (even gourmet store-bought) 🙂 What kind of icing did you use?